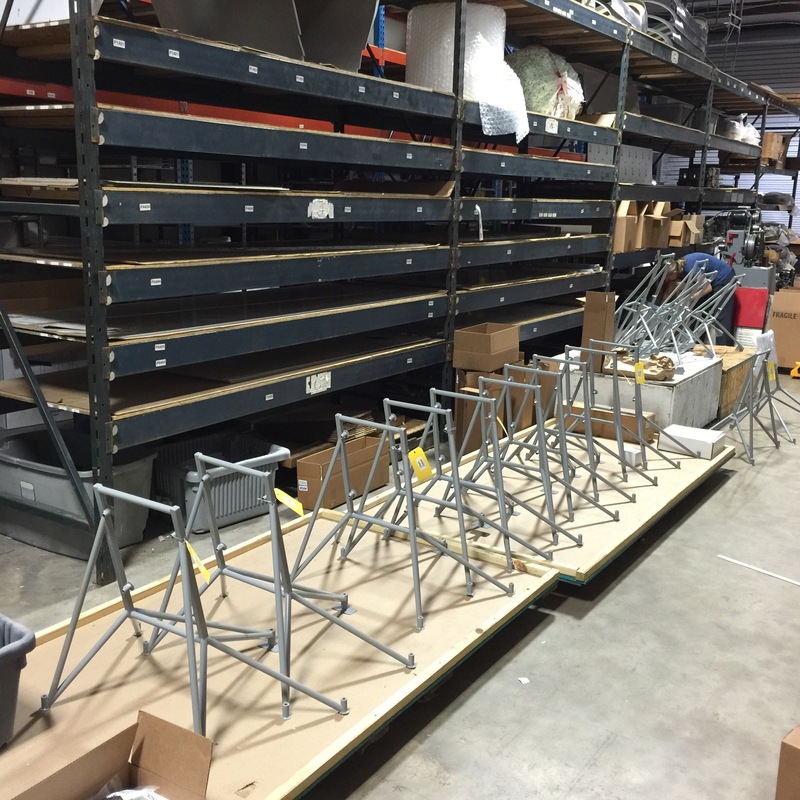 Below is a snapshot taken today at SPA/Pather’s shipping department: Notice that there are 17 Powder coated Corvair motor mounts ready to be shipped. This is only part of the total, there are more still in the powder coating process. Here is another advantage of working with the Wesemans: Although I have spent the last few weeks in Texas and California, progress with our parts still happens, and things are being shipped all the time. Last year when I was wearing too many hats and trying to meet family commitments, I got slow on making motor mounts. In addition to having Dan and Rachel handle the sales and distribution of our parts, I can also tap into their talent resources as well. Travis is the 30 year old head of their welding department, a very talented young man. When I needed to get caught up, Dan suggested I contract with them to have Travis weld out the CNC tubing kits, and bring my fixture over to their shop. Sounded great. I returned from California to find I have no more back orders, and we now have both styles of Zenith mounts in stock ready for immediate shipment. Synergy at it’s finest. If you need a mount for your Zenith, you can order one directly off the catalog link above. Even though I will be back in California in 48 hours finishing the western College tour, The Weseman’s will make sure your mount arrives shortly. If you have any specific questions on ordering not covered on the site, please call 904-626-7777 and speak with Rachel. I have been welding since 1978 or so, and I have welded parts that are flying all over the globe. I am pretty sure I have done 400+ Corvair mounts in the last 20 years. I can’t sing, nor dance, but I can weld, and I have some pride in that…..and that is what makes the next part hard: Dan and Rachel’s chief welder Travis, has been at welding for less than five years…..and he is better than I am. I know I am supposed to be a self actualized adult, and that competitive instincts are a sign of something, but damn, it fries me just how good Travis is. When I have welded 200 Zenith mounts, and they are damn good, but Travis’s third one looks better than any one of the ones I have ever welded, it just makes me feel old. What makes it worse is that Travis is super polite and very humble. When he is laying down the 100th foot of perfect bead for the day, I resort to childish things like saying “Travis, please explain the significance of the National Labor Relations act of 1934″ Without stopping the bead he politely says “I am not familiar with that Mr. Wynne” to which I respond “Well young Travis, you see there are more important things in life than just being a better welder than me, there is great stuff to learn like arcane trivia of American political history I know so well, so you see I still am a critical part of society, even if you can perform mundane tasks like welding slightly better than I care to.” I am reasonably sure I am the weirdest person Travis has ever met, and that is saying something because he is from Kentucky. Funny you mention motor mounts. The text below is from an email I sent several months ago and you never responded to. I hope you can take the time to respond to my question. I was working on forms for the firewall on my Zenith 650B today. The mount required some flexing to get it fit over the alignment pins on the form. Yes, 2 to 3 millimeters is within tolerance. Sounds good Thanks for the reply. “I am reasonably sure I am the weirdest person Travis has ever met, and that is saying something because he is from Kentucky.”……………another priceless quote from W.W.
William you crack me up man!